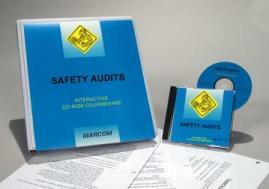 MARCOM's "Conducting Safety Audits" Interactive CD-ROM Course reminds employees about the goals of a safety audit, and how all workers should become involved. A single workplace accident can be devastating. Someone can be injured... or even killed. Property, equipment or materials can be damaged or destroyed. And work could come to a complete stand-still. All of these things can happen if efforts are not made to protect employees. One way to accomplish this is to conduct a safety audit. This is an examination of the work area to make sure it is as safe as possible and all potential hazards are corrected or removed. Areas included in the course include a workplace analysis, administrative and engineering controls, personal protective equipment, the equipment maintenance program, emergency response procedures, accident investigation, a safety self-assessment, and more. Using a powerful combination of audio, full-motion video, text and colorful graphics, this course provides the most cost-effective safety and regulatory compliance training available today. The course is divided into a number of logical sections so information is easily understood... and retained. Also designed with the training manager in mind, all courses in the Interactive CD-ROM Training Library include a learning management system (at no additional cost). Using this system, trainers can set up "Pre" and "Post" tests... establish log-in procedures... even define and set up curriculum for various job classes. The system also collects and organizes employee performance information through a powerful relational database, which can generate a number of record-keeping and tracking reports... and has a database "import/export" feature, which allows information to be transferred to and from an external database (such as a company's personnel database). The course is one of over 100 titles currently available in the Interactive CD-ROM Training Library.